PRICE: Free while they last with $30.00 purchase. Every year Wolfpak decals offers a special Thank You sheet to its customers. All one has to do to get one is purchase $30 or more of product from them. These are limited in number. This year we have five interesting subjects. The first is a QF-104A from Eglin in late 1961. The aircraft is overall FS 28913 and the whings are white with metal tanks. Next is an A-10 from the 18th TFS in 1986. This unit went from F-4Es to the A-10 and is now flying F-16Cs in the aggressor role. This plane is in the then-current lizard camo scheme. Our Army option is a CH-47 with the 82nd Aviation Brigade in Afghanistan during 2009. 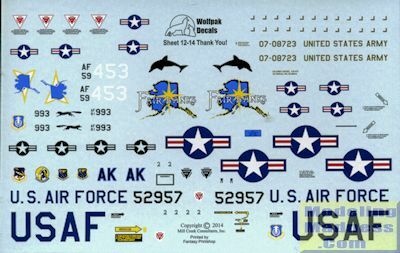 It is an overall FS 34201 and sports a dolphin marking on the rear. The RF-101B is one of the planes with the 192nd TRS, Nevada ANG at Reno. Interestingly, the only kit around for this version is the elderly Matchbox version. 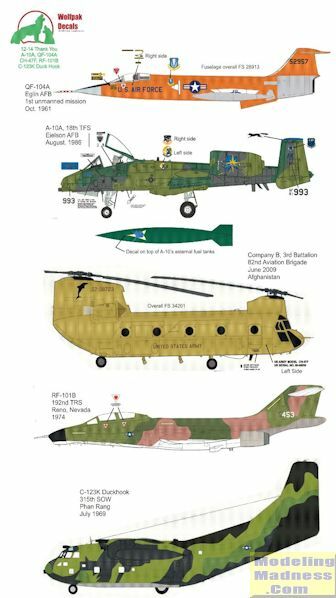 Surely someone will do a modern series of Voodoos in this scale. Finally, a C-121K in a pseudo lizard scheme when with the 315 SOW at Phan Rang in July of 1969. In this case the Mach 2 kit is the one recommended, at least until Roden releases this variant. As with the previous sheets, these are superbly printed and without any registration problems. This sheet will soon be gone so if you want yours, you need to get in your order as soon as you can.